On Monday, I wrote an ode to baked brie, and today I'm here with an ode to the BLT. Is there a summer meal more perfect than a BLT? A juicy homegrown tomato, perfectly crispy and salty bacon and fresh crisp lettuce. I think I may need a moment. I have been pretty vocal about my distaste for mayonnaise, but this is one capacity in which I think it is crucial. I typically like to mix it with some fresh herbs and/or garlic before spreading it on the bread for my BLT, which not only adds another layer of flavor to your sandwich, but it helps mask the "mayo" taste. ;) I could eat a BLT for lunch and dinner every day in the summer and never get tired of it. But this isn't about a sandwich, this is about a pizza. And this pizza is definitely worth writing about. I've been wanting to make a BLT pizza for years now, but could never quite conceptualize it. 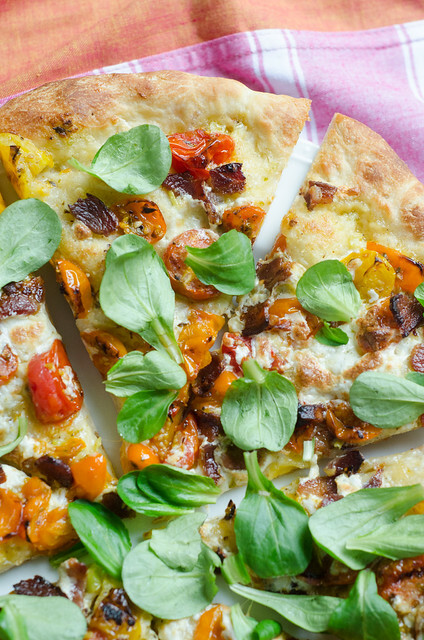 Leave it to Cooking Light to not only make a really freaking delicious pizza, but one that's actually relatively healthy and light. Imagine that! So remember how I said I hate mayo, but I use it on my BLT's mixed with herbs and garlic? Well that's exactly what you'll use as the sauce here. I know it sounds kind of icky to use mayo on a pizza, but it's just a small amount, and it almost "melts" into the dough, and it gives the pizza a rich and creamy taste. I also added my beloved roasted tomatoes to the pizza, sprinkled some bacon over those, and then topped it with a modest amount of cheese. After it bakes, comes the "L." Simply scatter some fresh leaves of your choice over the pizza before serving. The original recipe called for arugula, but it's not my favorite green, so I used mache instead. I've yet to even have my first BLT sandwich of the summer, but I'm pretty sure that the BLT pizza is going to become a regular occurrence around here as well. BLT sandwich for lunch, BLT pizza for dinner? Overkill? Preheat the oven to 400 degrees. Arrange the tomatoes in a single layer on a foil-lined baking sheet, and sprinkle with the oregano and pepper. Scoot the tomatoes towards the center of the baking sheet and fit the bacon around the edges. Bake for 20 minutes, stirring the tomatoes halfway through. Drain the bacon on a paper towel-lined plate then break into bite-sized pieces. Place a pizza stone in the oven and increase the temperature to 500 degrees. Meanwhile, whisk together the mayonnaise, oil, scallions, parsley, and garlic in a small bowl. Sprinkle the cornmeal over a large square of parchment paper, then roll and stretch the pizza dough into a 12-inch circle. Spread the mayo mixture over the dough, leaving a 1-inch border, then brush the border lightly with olive oil. Scatter the tomatoes and bacon over the sauce, then sprinkle with the cheese. Transfer to the pizza stone in the oven, and bake 10 minutes, or until the crust is browned and the cheese is melted and bubbly. Allow to cool 10 minutes. Top with greens, cut into 8 slices, and serve. 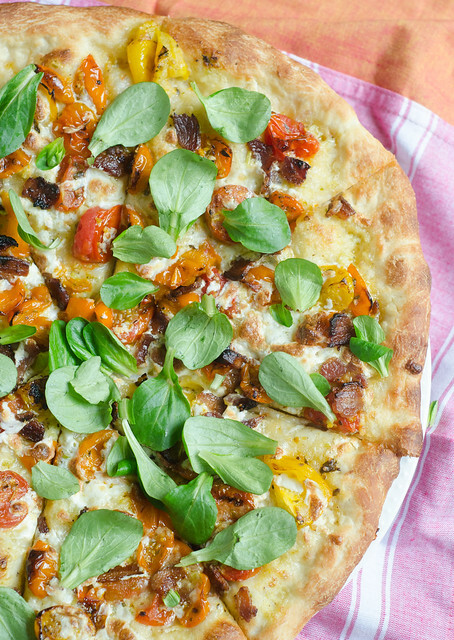 Lunch, dinner, breakfast, whenever, this pizza looks sooooo good! There is absolutely NO way you could go wrong with this combo. This flavor combo is classic. Pizza is my favorite choice, but more often alone or call home or go out to eat but do not try once. There are recipes here then and when possible I will do. I've never really liked mayo but I think there's a California Pizza Kitchen pizza that uses it, which I love. So maybe I do like mayo but just on pizza! Seems to be a comment opinion. :P Looks just as good here as on the cover of CL!